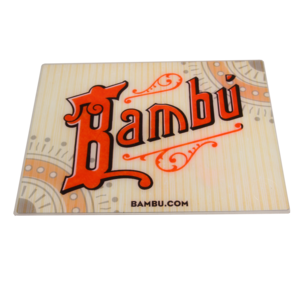 This Collaboration is a custom Bambu Oil Slick Canvas is made to protect and beautify your most precious possessions. Forget about old mousepads and dirty rags! Your glass, and your table, deserve Oil Slick. These pads are grippy, soft, and as always, non-stick! The surface is completely smooth with nothing to wear and tear. The silicone use dis an ultra-clear formulation specifically made by Oil Slick for use with glass. Sticks to your table, and glass…not your oil. This is a pre-order that will ship on 9/30/2016.